Let’s build a real-time service dashboard! Our service dashboard will show us real data in real time. It will show us what’s happening on our server and our micro service in near real time, asynchronous, non-blocking fashion. Take a look at what a full client can look like here. A demo of the server can be seen here. We’ll build a smaller version of this dashboard using the AngularJS framework and lots of cool real time charts with lots of real time data. 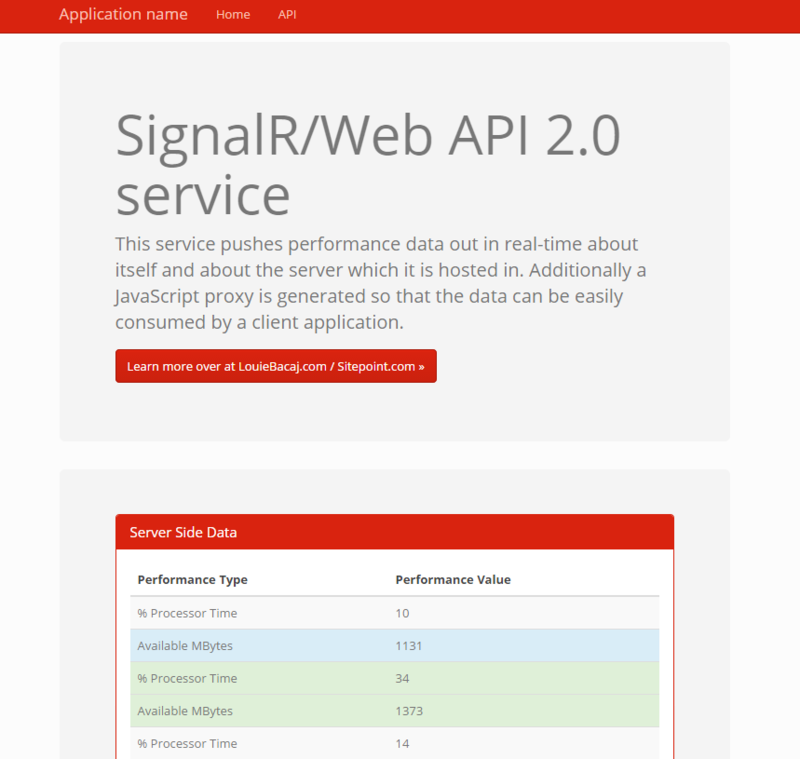 We’ll also build our service using the SignalR and Web API libraries from .NET 4.5. AngularJS forces great application development practices right out of the box. Everything is injected in, which means there is low coupling of dependencies. Additionally, Angular has a great separation between views, models and controllers. Angular compliments .NET here by allowing the server side code to remain small, manageable and testable. The server side code is leveraged solely for its strengths – which is to do the heavy lifting. All of the AngularJS code used in this tutorial can be found here. I will go over creating this with your favorite text editor and plain folders, as well as with Visual Studio for those creating a project. Setting this up through Visual Studio is extremely simple, if text files are too simplistic for you. 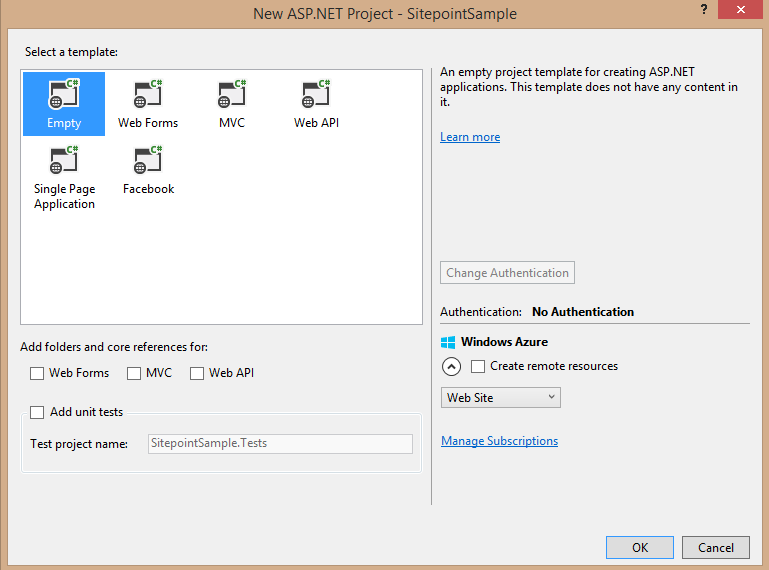 Simply set up an empty web application by going to File -> New -> Project, then select Web as the template type. Finally, Nuget does not contain the Epoch, ng-epoch and n3 charting libraries, so you’ll need to add them manually. Simply follow the steps detailed in the previous section to get these. Now we are ready to write some code. There are a few things going on here. We are, first and foremost, adding all of our dependencies so they load up. Secondly, we are referencing a few new files (all of the files in the app folder) that do not exist yet. We will write those next. Let’s go into our app folder and create our app.js file. This is a very simple file. This file does a few things for us. It sets up our main application module angularServiceDashboard and injects in two of our external references – ng.epoch, which is our Epoch.js Directive for Angular, and the n3-pie-chart, which is a charting library made for Angular and is properly structured. If you notice, we also inject in a value for the backendServerUrl, which of course is hosted somewhere else and which we plan to consume here. This bit of code uses the popular on and off (with no off since we don’t need it here) subscription pattern, and encapsulates all of the communication with SignalR for our app by using an Angular factory. Additionally, this code allows the SignalR Server, which is sitting on another box somewhere, to call our app through the on method. It allows our app to call functions inside of the SignalR Server through the invoke method. Next up, we need our controllers, which will bind our data from the service to our scope. Let’s create a file called controllers.js in our app folder. This controller does a few things here. It creates our Angular Service object and binds a callback function to it, so that the server has something to call in our controller. You will see that we are looping through the JSON array returned by the server each time it calls us back. We then have a switch statement for each performance type. For now, we will set the RAM and come back and flesh out the rest. As far as our directives are concerned, we really only need one for our Epoch charts. We’ll use an open-source directive called ng-epoch.js, which we already have a reference for in our stub index.html file. We could split all of these charts into different directives, use some templates and use UI-Router, but we’ll keep things simple here and dump all our views in our index.html file. This will simply create a place for the server to push back the RAM data. Data will first go to our service, then to the controller and then finally to the view. Now let’s add some charting, which is what we really want to do. We will add a variable called timestamp for the epoch.js timeline. We’ll also add an array called chartEntry, which we’ll bind to our epoch.ng directive. Then let’s map the data in our switch statement and add the rest of the required epoch.js data items. We could, of course, break this out further (such as use some more functions and filters), but we’ll keep things simple for the sake of the tutorial. Our controller looks a bit more fleshed out. We have added a realtimeAreaFeed to the scope, which we’ll bind to our view via the ng-epoch directive, and we have also added the areaAxes to the scope, which dictates the layout of the area chart. chart-class refers to the coloring scheme of D3.js, chart-height is what you suspect, and chart-stream is the data coming back from the SignalR server. Let’s now wire up a whole bunch of data points to this chart, and add a whole other chart from the n3-pie framework (because who doesn’t love pie!). The value, of course, will be updated by the SignalR server. You can see this in the full code for our controller. We should also take a moment to consider the full code for our view. We have seen that Angular can wire up to SignalR extremely easily – by simply plugging in the end point in an AngularJS service or factory. The AngularJS factory is an encapsulation mechanism to communicate with SignalR. Who knew that AngularJS and .NET would work so well together when “married up”? Let’s add a PerformanceEngine class, which pushes to anyone that will listen with real performance data. The engine sends these messages via SignalR to any listening clients on an asynchronous background thread. Due to it’s length, you can find the code on our GitHub repo. This code basically pushes an array of performance metrics out to anyone that is subscribed in each while iteration. 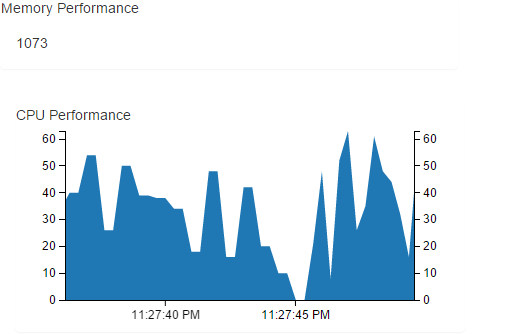 Those performance metrics are injected into the constructor. The speed of the push from the server is set on the constructor parameter pollIntervalMillis. Note that this will work fine if you’re hosting SignalR using OWIN as a self host, and it should work fine if you’re using a web worker. The last thing to do, of course, is to start the background thread somewhere in your service OnStart() or in your Startup class. The two lines that start the monitoring on the background thread (as I’m sure you’ve guessed) are those where we instantiate the PerformanceEngine and where we call the OnPerformanceMonitor(). We’ve seen how to consume SignalR data through Angular, and we’ve hooked that data up to real time charting frameworks on the Angular side. A demo of the final version of the client can be seen here, and you can get the code from here. A demo of the final version of the server can be seen here, and you can get the code from here. I hope you’ve enjoyed this walk-through. If you’ve tried something similar, tell us about it in the comments! because who doesnâ€™t love pie! "Who doesn't love lines!" would have a bit of a different connotation. Anyway, I corrected the link in the article. 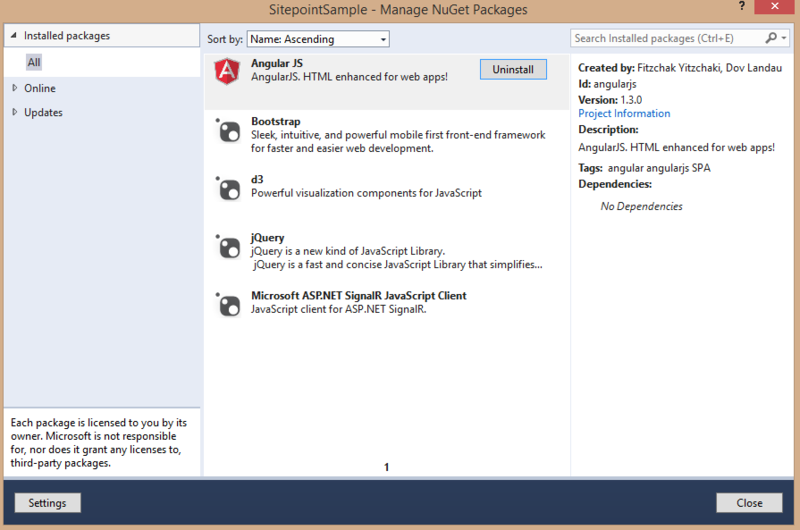 Thanks for detailed explanation for signalR using angularjs and web api. We have same requirement in our project. Your article very useful to me. Great article! Very usefull as a starting point. Could you also explain how to publish the SignalrBackendService to Azure? I can't get it to work when I publish it to my own azure account. Do you need to configure a service bus or something? You don't need to configure anything special on Azure. The only issue is the "Real" performance metrics through the performance monitor won't work on Azure because an Azure Website doesn't run on its own Machine etc, it's a shared environment. So turn that part off in the performance engine and add your own numbers there, like some random number generation or something else you can capture like logs or users registering or whatever your use case that changes dynamically is. Locally since you're running it on a full blown machine all the performance monitors work. Azure has other performance monitors for websites that I belive you can tap into but I haven't really played around with those so I can't advise too much there. This is meant to be a proof of concept on how one could push data from the server to the client leveraging .NET, SignalR, and angular and the performance metrics seemed like a great use case but unless you have a full server you won't have access to the performance monitors.